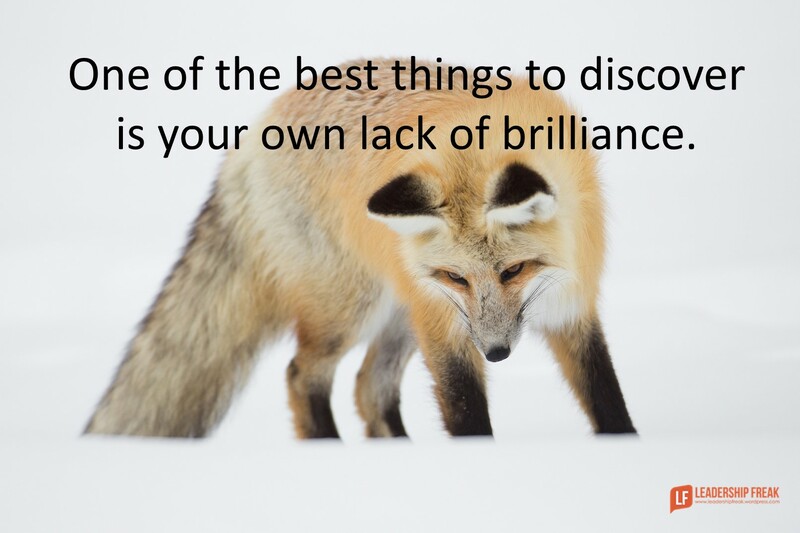 One of the best things to discover is your own lack of brilliance. Stressed out. If stress makes you dumb, some leaders must be dim-wits. #1. Take a shower. Cleanliness might not be next to godliness, but it’s smart. According to “Wired to Create” 72% of us get creative ideas in the shower. Maybe you need a whiteboard in the shower to capture your great ideas. #2. Put your feet up for five minutes and breathe deeply. If you can’t get all the way to five minutes, try three. #6. Lighten up. Being serious all the time cuts the blood flow to your brain. #8. Listen to classical music. When I was in high school, I was told that classical music made you smarter. Maybe they wanted us to listen to classical music. #9. Be a little less certain. Think, “I could be wrong.” or “What if they’re right?” An open mind has greater opportunity to learn. #10. Explore new ideas before defending old. Ask, “What did you mean?” before saying what you think. I notice in team meetings that people are quick to explain why ideas won’t work, even though they haven’t thought about how they might work. That is very well articulated. The thing that I have importantly learned is..leadership can be found and practised everywhere. A leader needs to be smarter than ever to the point of having a notebook everywhere. Thanks abiasmayalu. Your comment reminded me that Richard Branson, founder of Virgin, is a vociferous note taker. That’s a pretty good example. Sometimes, in carrying out an idea that “won’t work”, you discover an idea that “will work”! Thanks Betty. Sometimes I think that people just need to give an idea a chance. As you suggest, we often find the best path while walking down an imperfect one. Frankly, imperfect progress is better than no progress. It would be ‘smart’ for me to be in bed and fast asleep right now! Night Night. Thanks for the chuckle tooarbie! Breathing is good, for sure. And so is, “stepping back from the wagon,” to try intentionally to look at things a little differently. Meditation skills are useful, even if one is amateurish about it — that focus on relaxed thinking is really all that it takes. Conversations are good – not the directed feedback kind but simple chats about issues and opportunities. There was a guy in LinkedIn proud of his getting 4 hours of sleep and arising to start work at 0400 every day. I told him to call me after 0900 at the earliest, jokingly, but he responded that it was actually his lunch time. Seriously? There is that concept of Work / Life with the third word being BALANCE. We have some really weird thoughts about working, vacations, stress and productivity here in the US. People here check their work email at the dinner table, when they go to bed and when they first get up in the morning, and they consider that NORMAL. I’m early riser and a nap taker. 🙂 After thinking about this issue, I’m putting my laptop away earlier in the evening. Just a word of warning…I fear your mind might be turning to mush if you get a self-driving car!! By the way, I thought of Huxley’s, Brave New World, while reading your comment. I forget the character’s name who chose humanity over fantasy. Maybe we need a bit more wood chopping in our lives. 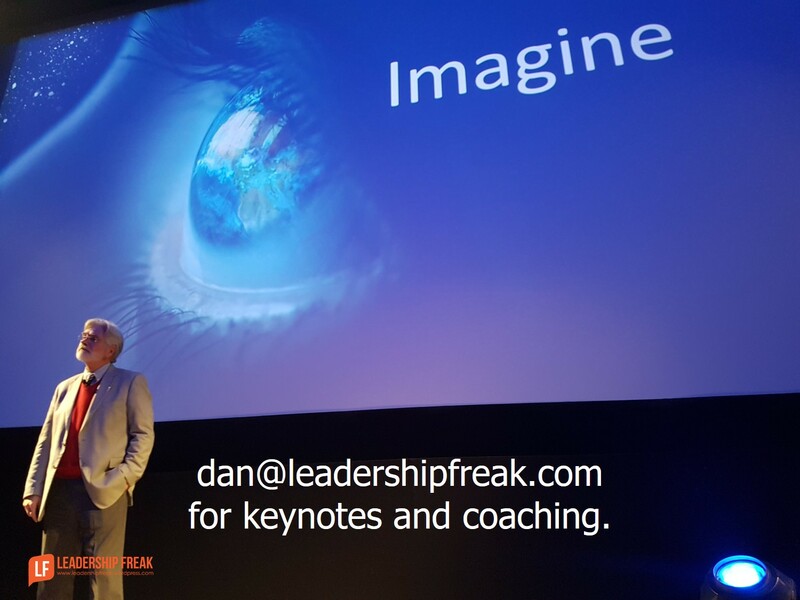 Dan my first boss and Mentor George taught me a technique that helps when, as a Leader, you are overwhelmed with issues. George would go into his office, shut the door and do some simple but necessary task that he knew he could accomplish. For example we had a special executive payroll account that only he was supposed to review and reconcile. By getting this one task done, it was easier to deal with the bigger issues. This really works! Thanks Brad. Yes…great strategy to find a new perspective and energy to tackle the next task. Your comment reminded me that mindless work…something we can do from habit…is another way to find think time. Great list! Sometimes we just need to step away in order to get perspective. Shower. I thought I’m the only one who thinks about ideas there. Personally speaking, I get ideas even in the toilet. I hate exams and they don’t even let me to write exams while taking showers or in toilets. I enjoyed your post. Thanks. Thanks Shubham….hahaha…maybe teachers should give exams in restrooms. What makes leaders dumb? Continuing the expectation that we have to be the sharpest tool in the shed. What makes leaders smarter? Finding smart people, placing them in the right positions, and letting them do their jobs, which makes me pretty smart. Reminds me of something my PhD advisor said to me in our last conversation. My advisor was Dr. Russell Ackoff, one of the preeminent systems thinkers often referred to as the Einstein of Systems Thinking. Suggested reading: “Management in Small Doses” by Dr. Russell L. Ackoff. He covers 52 management subjects in two to three pages each in an entertaining fashion. Great list Dan. Tongue in cheek comment – dumb could equate to not ensuring the whiteboard and pen in the shower are waterproof, smart would be making sure they are indeed waterproof. #4 nearly brought tears to my eyes, so refreshing to see ‘writing’ mentioned. Yes I still write things down, not only to get thoughts out of my head but to keep up the diminishing skill of handwriting. If you have a thought, an idea, I find it always good to start noting down (writing) or even drawing it out, developing your idea on paper first. If something really messing with my head, my brain being obstinate in understanding, requiring more time to ‘work something out’, if I write it down along with thoughts, idea’s, any ‘light bulb’ moments, this so helps. I have at times gone as far as keeping a notepad and pen beside the bed, whilst you are finally winding down (hopefully) before slumber takes over, can also be when clarity is at it’s clearest. So much good conversation on this post. I enjoyed the post of which I regularly remind myself of #9. The conversation and comments on today’s post have also been extremely valuable. Thank you, all. “Limits of Knowledge” is an Undergraduate Degree Level Expectation in Canada….so technically everybody with a degree should be learning about their own lack of brilliance. Pretty hard to grow when you think you know everything….but there are definitely times when it’s nice to have somebody that believes they know everything on your team in certain situations. I like using a pen and paper to write things down. I often use that as we way to “make things real”. To me when you write a aspiration out of your mind and put it on paper it becomes a goal. For most people when they set a goal it becomes very hard to let it go without achieving it so I really value writing thing down by hand on paper. I feel like it helps me keep track and organize my day, my week and how it relates to my monthly goals, quarterly goals, and yearly goals.